The reading from the Gospel according to St John for the third Sunday of Epiphany, tells the story of Jesus turning water into wine at the marriage in Cana, Galilee. Jesus, his Mother and some of the disciples were there. The wine ‘failed’ and Jesus was told by His Mother ‘They have no wine’. He protested that His time had not yet come, but instructed the servants, told by Mary to do exactly as Jesus commanded, to fill 6 stone water pots with water. Each pot held 2-3 firkins. When the servants drew some of this water, now turned into wine, and took it to the steward or ‘governor’ of the feast to test, he praised the bridegroom for saving the best until last. This story is represented in a window in St Swithun’s, in bright colours, with the story partly told in the scrolls of words underneath. You can find all this in the upper part of the window just outside the Memorial Chapel, on the south side, or right side as you face the altar. 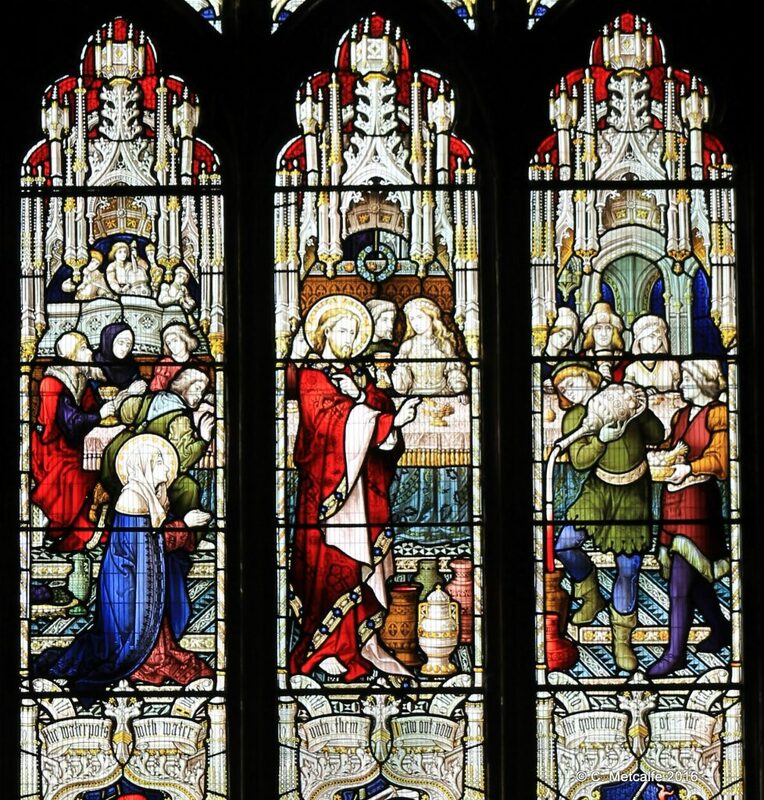 The window was given in memory of George Clarke and is the work of Hardman, dated 1879. Members of the Clarke family also gave the East window and another at the back of the church on the south side. The skill of the craftsmen who created this detailed scene, and the generosity of the patrons towards St Swithun’s church are, as ever, very impressive.